As well as providing a great fit and genuine protection against tooth or jaw injury, the POWRGARD® range features advanced mouthguard designs sure to satisfy the performance demands of all athletes. These patented features are uniquely designed by POWRGARD® and make POWRGARD® mouthguards a must have for sports people looking to perform at their best. All POWRGARD® mouthguards are injection moulded using high quality EVA. This ensures superior moulding, increased comfort, greater retention and advanced protection. 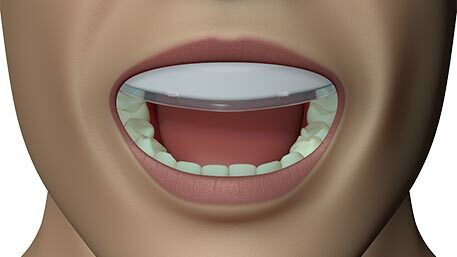 If necessary POWRGARD® mouthguards can be remoulded should they become loose or teeth change position. Manufactured from high quality EVA, Ultimate Grip means Powrgard® mouthguards mould snuggly, fit comfortably and are not easily dislodged, even during jarring impacts. POWRGARD®’s dual layer technology allows for an advanced manufacturing process which incorporates a hard inner core and a soft mouldable outer layer. Using a multiple injection process ensures superior protection against direct impact for the front teeth as well as jaw joints and unlike mouthguards with rigid outer layers, POWRGARD®’s soft, mouldable outer layer significantly reduces lacerations. Dual layer technology is featured in POWRGARD®’s DualProtect and ProProtect ranges. POWRGARD® mouthguards featuring dual layer technology have a rigid inner core for serious protection and a soft outer for premium comfort and fit. 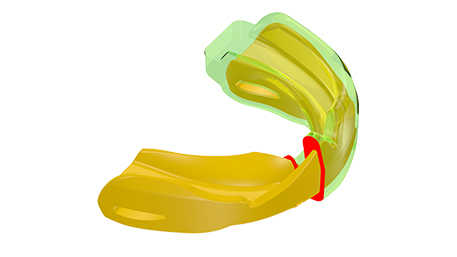 Mouthguards featuring POWRGARD®’s Mandibular Orthopaedic Repositioning Appliance (M.O.R.A.) design position the lower jaw slightly down and forwards, which maximises upper body strength and flexibility. Scientific studies, conducted during the last 20 years, have demonstrated measurable increases in strength and performance for athletes influenced by M.O.R.A. Performance enhancing M.O.R.A technology, incorporated into POWRGARD® mouthguards positions the jaw slightly down and forwards which maximises upper body strength and flexibility. The soft mouldable outer layer of POWRGARD®’s Professional, Crusader, Stealth and Extreme™ models ensures the lower teeth can mould to the underside of the mouthguard. This provides improved comfort and increased protection for the lower teeth and jaw as well as enhances the mouthguards M.O.R.A. effect. 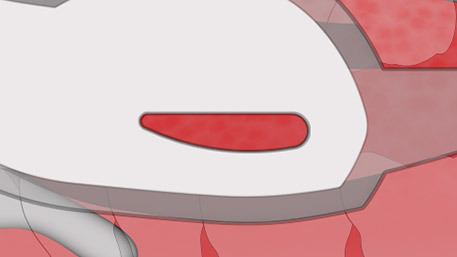 This feature is unique to only the highest quality mouthguards. Fully Articulated POWRGARD® mouthguards allow lower teeth to mould to the underside of the mouthguard to ensure added comfort and protection. A jarring blow to the lower jaw can damage the jaw joint and also has the potential to cause concussion or brain injury. The patented Air Spring Core™ integrated into POWRGARD®’s Professional and Crusader ranges absorbs the force of these types of impacts ensuring the potential for trauma is minimised. 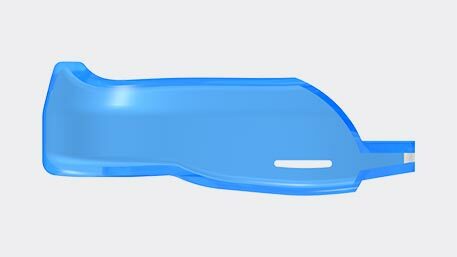 The Aerofoil Base integrated into POWRGARD®’s Extreme, Stealth, Junior and Univers ranges, maximises the thickness of the mouthguard base in the rear molar area ensuring the jaw joints are cushioned against jarring impact and the potential for concussion is minimised.. The thickened Aerofoil Base ensures the wearer’s jaw joints are protected against jarring impacts. The hard inner Shock Transfer Core™ integrated into POWRGARD®’s Professional, Crusader, Stealth and Extreme mouthguards prevents distortion on impact and transfers the impact’s force away from fragile font teeth back to the stronger molar teeth. 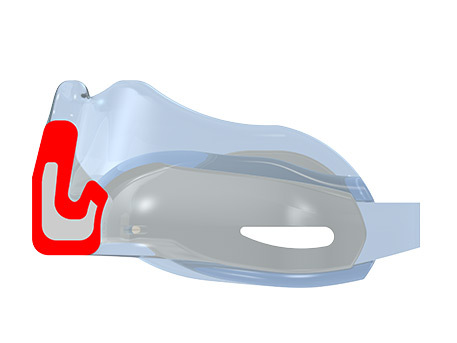 This patented feature ensures wearers are provided with the best possible protection available from any mouthguard on the market today. 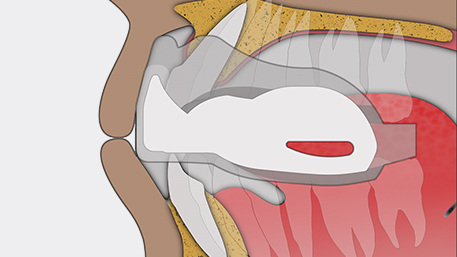 The POWRGARD® Shock Transfer Core® protects the wearers front teeth by dispersing impact force to the stronger back molars.